Stairs/Elevator) and within the Window Space of the Walsh Library Gallery are three views of the life and works of Dr. John Ching Hsiung Wu 吴经熊 (1899-1986) who was a former Professor of Asian Studies and Law at Seton Hall during the 1950s-60s along with his wider work in justice studies, inspirational verse, academic promotion, and publishing endeavors. More biographical information can be found via this website which provides some introductory context on his scholarship to go along with the primarily source materials found on campus. These and other sites can offer further insight on the legacy of Dr. Wu. In more specific terms, among the accomplishments made during the lifetime of Dr. Wu include his role as lead author of the Zhōnghuá Mínguó Xiànfǎ (中華民國憲法) or Constitution of the Republic of China (present day Taiwan) which was adopted at the National Constituent Assembly of this nation on 25 December 1946 and went into action exactly one year later. He was there at the foundation of the Seton Hall University Law School in 1951 with its campus in Newark became another specialized educational center that offered courses in juris prudence to its student body. Dr. John Wu who received his doctorate from the University of Michigan became one of the founding faculty members of the new institution and was active in teaching, scholarship, and promotion of legal education at home and abroad. In line with the contributions of Dr. Wu, with the successful launch of the Far Eastern Studies Institute during the early 1950s and contributions of a dedicated faculty and supportive administrators led to wider educational and diplomatic initiatives later in the decade. This culminated with the awarding of honorary doctor of letters degrees to four major Asian leaders that included (in alphabetical order): John Myun Chang (Vice-President of the Republic of Korea), Chang Chi-yu (Minister of Education of the Republic of China [Taiwan]), Ngo Dinh-Diem (President of the Republic of Viet-Nam), and Paul Francis Kotaro Tanaka (Chief Justice of the Supreme Court of Japan) in 1957 and was a landmark time as Seton Hall had cemented a solid relationship with the different Asian nations which contributed to international collaboration and good will. 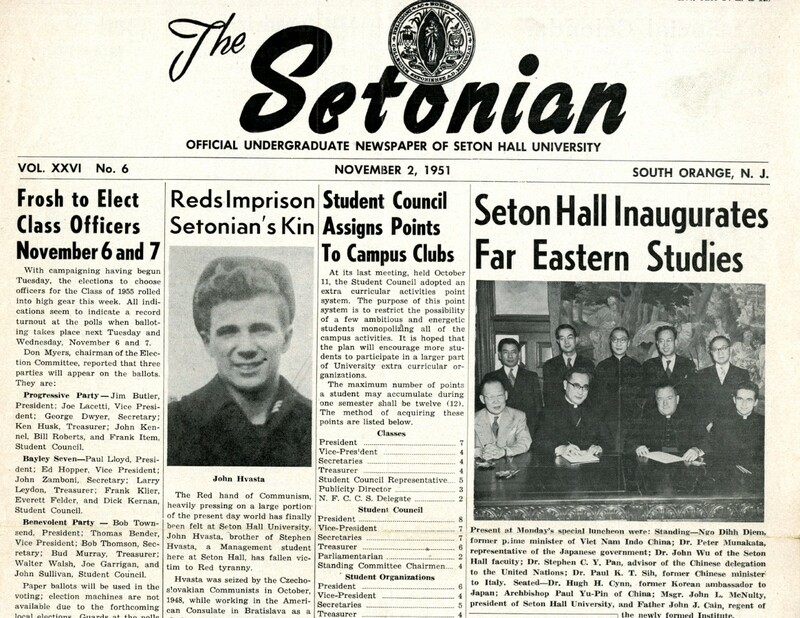 This also led to a period of creating reference guides for the wider linguistic community and those who wanted to publish and led to the creation of the Seton Hall University Press in operation during the 1960s and 70s which was active in producing dictionaries, grammar studies, and other aids to help students locally and across the globe. The aforementioned components can be represented in these displays and the lasting availability of archival resources based on the life and works of Dr. Wu are based in large measure on the recent Symposium held from April 21-22nd 2016 here on the campus of Seton Hall University. More information about the speakers and subject areas can be found on the Symposium webpage. When it comes to specific exhibit themes various books by and about Dr. Wu from our collection and that of the Main Collection, Walsh Library are shown along with a number of information leads that represent the 65th anniversary of the Far Eastern Studies Institute along with the latter day Asia Center, and the contributions of those who have made Asian culture a significant part of the academic and cultural life of Seton Hall over the past six decades plus. For more information about Dr. John Wu, Seton Hall history, or other queries please feel free to contact us by e-mail: Alan.Delozier@shu.edu or via phone at: (973) 275-2378. Thank you in advance for your interest.